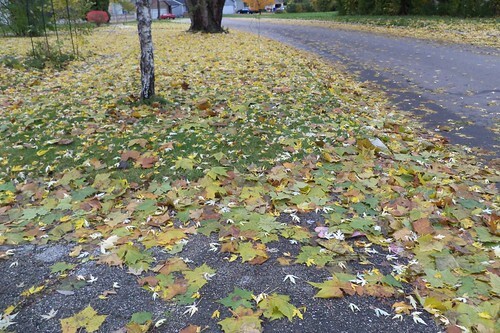 The heavy rains of last week knocked down almost all of the remaining leaves from the trees. You almost couldn't see the grass in the front yard for the leaves. In spite of the heaps in the street, water drained very well. There were no pools by the drains. The big leaves are sycamore from the tree south of the house. My yard has a huge maple from which all the rest come. What I love about fall rains and leaves is the smell. Here I go again, telling you about the smell, but that smell defines fall for me. It's such an earthy, elemental smell. 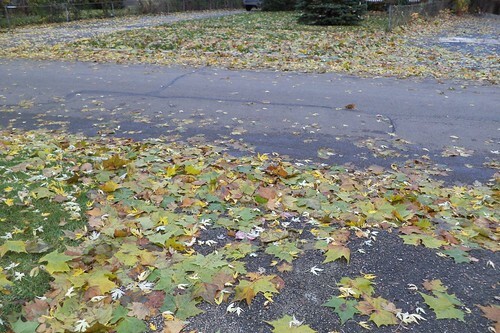 As it was garbage night, I just stood in the drive inhaling the aroma of wet leaves. Yesterday, we had temperatures dip well below freezing. 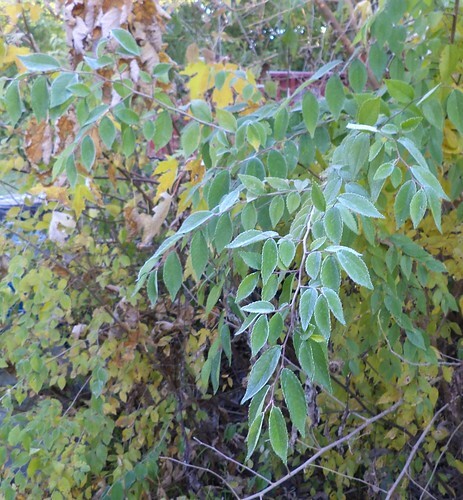 The resultant frost outlined everything, especially leaves. I love the look of these. Edged with frost, the color really stands out and each leaf is more noticeable. My allergies have been kind of bad in October so I have not been able to go out and inhale the fall air with its earthen goodness. Now that we have had consistent frosts, I'm hoping that will ease whatever allergens I encounter. Then I will be able to wander a bit and really enjoy the last days of fall.